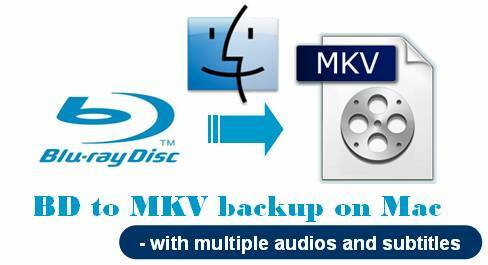 MKV container format is no doubt a nice choice for both Windows and Mac users to do Blu-ray conversion with multiple audio tracks and subtitles streams included, as well as the original video quality preserved. Additionally, the subtitles tracks and audio tracks packaged in the MKV container are not burnt into the video, so users are free to select wanted audio/subs track to display during playback, as well as switch on/off subtitles during viewing (See more about BD/DVD Backup: why choose MKV?). The guide below intends to provide Mac users with a solution about how to keep multiple audios and subtitles when processing BD to MKV backup on Mac. Mac Blu-ray Conversion-how to keep multiple audios and subtitles? First of all, connect your external BD drive to your Mac, and insert the Blu-ray disc to it. Step 1: Run Pavtube ByteCopy for Mac and click “DVD/BD DISC” icon to load the source movie. Pavtube ByteCopy for Mac is able to detect the main title in a source movie automatically, and meanwhile only tick off the main title by default. If you want to backup other titles in a BD movie to MKV as well, you can simply click “Check All” button. To see the detailed information of the source movie, you need click the “triangle” icon before the title name. Once you click the “triangle” icon, all the information of video streams, audio tracks, and subtitles tracks will display as below. If you wanna delete a certain audio track or a subs track, just remove the checkmark before it. Step 2: Click “Browse” button to specify where to locate the output MKV file. After the blu-ray conversion is completed, you can click “Open” button to get the generated MKV files easily. For MKV playback, please see how to play Blu-ray MKV in VLC on Mac with selected audios/subs? Fantastic control of all audio tracks, subtitles streams (on/off), and chapters. Make MKV for playback with WD TV, Popcorn Hour C-200, XBMC, VLC media player, etc. How to copy DVD and Blu-ray movie to your hard drive without quality loss? How to rip Blu-ray to MKV with DTS 5.1 for all audio streams? How to backup DVD and Blu-ray collections to home server?